Analysts have the smallest percentage of buy ratings on Apple stock since 2005, a contrarian indicator. One strategist said analysts are "throwing in the towel" on the name. "It's interesting from a sentiment and contrarian view point," said Todd Sohn, technical strategist at Strategas Research. "The analysts are throwing in the towel on the name. It may take a few months for it to repair and chop around here, but I think it's in the process of forming a bottom." Sohn said Apple is down 39 percent from its Oct. 3 high. "That's a pretty good shakeout and you can combine that with the stock ratings," he said. Buy ratings reached a high in 2010 to 2012 when they were mostly more than 90 percent of the ratings. 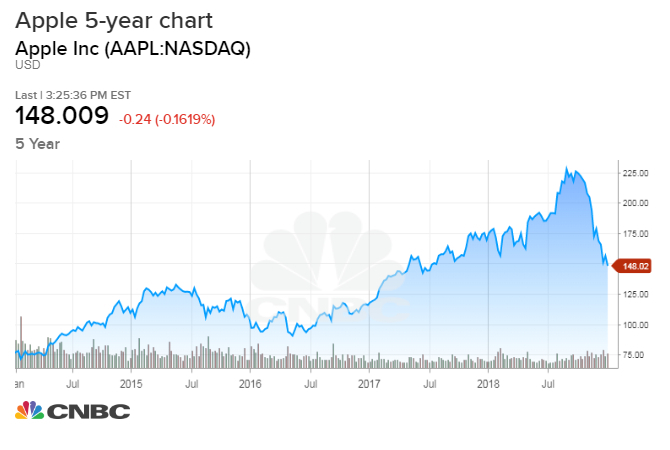 At that point, Apple's stock was in an uptrend.